Percival18 Yu-Gi-Oh blog: Poll: which field effect do you like more? Poll: which field effect do you like more? This poll is about the background changing when a field spell is active. After getting several requests about this I decided to make a poll about it. Which one do you like more? Vote on the poll at the right side of this page! The first one covers the entire background like in the Tag Force games. The latter covers the duel field only like in Yugioh Online and the World Championship series. I personally liked the first option more, but the majority rules. Field background only it is! Thanks to everyone for voting. I'd have to see how it looks with an actual background instead of just gray. You are right.. I will make a mockup. Make sure you use the poll! The Second one of course. The good with second one is that the images aren't stretched so much and you can see the whole field card. Full field , but I just want good for everybody, I just say that if you have time to do and you want too, please make download link for both choice, if not too big file(s) , and I think everybody will be happy. I like the 2nd, only cuz the 1st it so scretched. The first one by far. A field spell doesn't just affect the monsters, it affects the ENTIRE duel. The players themselves included. Once a field spell goes active, the background change can be empowering OR intimidating. The fact that the 1st one does that not only affect the in-game, but also the players' psyche. As it should. To any of you those watch the show would understand. A field spell is like watching into the enemy's territory OR into your home-advantage. Also you could make it optional? If it uses yugioh online style, it covers own custom playmat. I am using own custom playmat, so I vote for TagForce style. Sorry guys it will not be optional. The more choice players have, the more questions people will ask about it. I currently have to answer more than enough of the same questions already. I hope we can do tag-matches in the future. Second one! I vote btw, amazing! Will there be an option to randomize the duel music in the background in later revisions? Could you make one option to enable/disable full or field background?, because 2 pictures look great. is it poslible that the main, deck edit and duel background be a other picture ??? Would be great if we can choose in the in-game settings. Cuz the problem i see in the fullscreen field its just the size of image: its bad just when it become too stretched or in bad quality. The second! It's a FIELD spell card, not a Background Spell card hahahaha And in Power of Chaos, it changes only the field too. Yes, Fred, the fullscreen mode stretchs too much the card images, should be an option to choose what resolution we need in fullscreen, for wide desktops. Pls percy add the new cards to the game with the new update. Completely unrelevant, but I don't know where I should ask this else. Will animations like in Tag Force or Duel Accelerator ever be added? Like, when summoning a card/activating a spell? Would be really really cewl. Never say never. But it surely won't be added by me. Yeah as long as the background is animated I don't care too much, but I think maybe the second one but the background being an animated background like in tagforce or yugioh online would be amazing. Couldn't we just put in an animated gif? Hey Percy why you don't put two alternate executables one for who want the Full field(this for me is better) and one for who want the Field background only.I think this is the best option. Thus everyone wins and everyone is happy. And make things even more complicated? Both are interesting, but I like more full background because much of us are using personal backgrounds and field background only can broke our personal backgrounds and will look too bad than a full background field. Oh and I need some help.. can someone give me a link of Ygopro card backfaces? I want to change and I remember a card backfaces folder wich was in a previous version. Thanks! You are 100% correct the field should does affect the ENTIRE duel. Second one ( Field background only ). To be honest they're both good. I wouldn't be able to decide which one. I second this to the highest! That would be awesome! how about having an option in ygopro you decide what kind of field you want? I prefer the second I think it looks much better. Hey can you give-me this background? Full Background (tagforce style) would be good if it animated. since this static picture, I prefer second one so it's feel like power of chaos and yugioh online. great, but why it's lower part different from upper part???? full field is not keep respect ratio. Can be set in the options for? Now I edited a lot of summons Animations from tag force games, made them an AVI extension with 3 mb each video... they are 135 different videos. 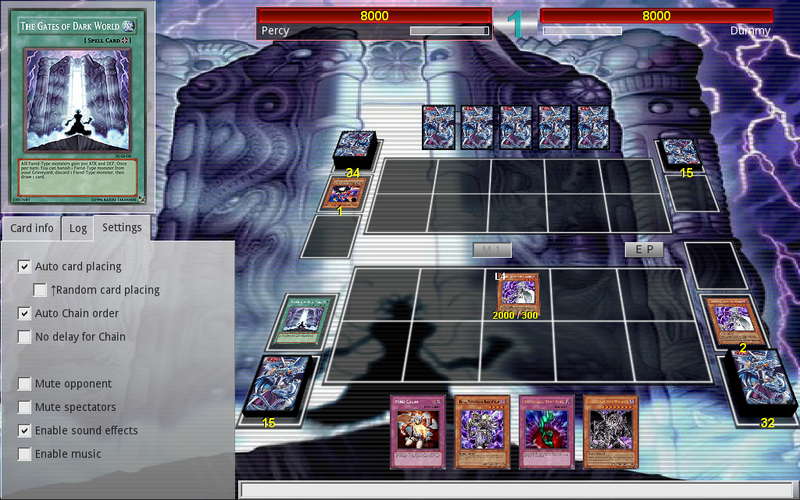 Exodia Animation, Destiny board, when Stardust is summoned etcetera. I suggest just giving players the option to choose the what the fields do. It would make both sides happy without having to get rid of anything. Second for sure. Spectator chat is impossible to see if the field covers the whole screen. Second one; Also could you put a rush on the sanitation script we have had 5 server attacks today alone. that sounds pretty bad...it will make the game much slower. i hope that this game will never get animations cause they take so much time. what a waste... why don't u just make both the background and the field background changing at the same time? I like 2nd one because I'm using the custom background. Spec chat needs to be made a lighter color period. Black text on a black background that is slightly transparent. Thats really bad visual/UX design period, Especially with a way to turn off spectator chat. This can be useful or not by you. I design a little, so that "ygopro" could be better. it's really nice... I'm using this one currently! Percy, i never seen the source code, but there are a posibility of change the PNG library for an APNG library (Animated PNG)? That could be great, because that format supports animations with loops or without loops, so you can make a animation with transaction between the common field and the new field, or a animated field, only changing that lib. your design is quite nice..
but i think percy has thinking another amazing design..
by the way...i like first one though..its like field spell surround you...not just in field duel.. I prefer the second one, because a) I use my own custom backgrounds and b) the resolution doesn't have to get effed up. Hey, it would be cool if there was the ability to forfeit, so you can leave a duel you are obviously going to lose. I know I could just quit the program, but that seems rude. For what? It is written what has time left. if you want to see the duel one does not have to wait when the host. but could when they were dueling, and we can go to see them duel. it is the development of all the duelist who want to learn to see the duel. I'm sure if you watch the duel mode that now is not to be used by all duelist. it's not necessarily because one wants to see is their favorite duelist. because such a duel mode is very helpful for the development of duelist who want to learn. shadow of the six samurai shien. I hope you like it percy and put in the next version ygopro. because I see six sam's card has low quality. if you need a card with HQ quality maybe I can help. in making cards, I use Corel and photosop. Is there any possibility to add a surrender button for the TAG duels? It will be really nice. Two buttons at the left top. The first says Suggest Surrender and when you choose it your partner should decide if the duel will be ended or not. The second says Surrender and it will end the duel immediately. Percy what do you think about that idea? Is it possible to be made? hii percy, why we can not save "replay match" again? percy i think you should make a options button in the nav menu..
Shien XYZ is LEVEL 5!!! percy i dunno if im the only one that this is happening to but i cant save replays anymore. when the duel ends it just ends. Yeah, but the surrender button doesn't appear until a few turns into the game, and sometimes something comes up where you just have to leave/surrender. I had some great wins today but i couldn't save them. I suspect the server being the culprit. Does the same problem also occur on another server and lan games? can u do a tutorial on making a HQ card? would be awesome. with a tutorial evryone can work on this. Can you add Turbo Duel Mode? That would be amazing! Vanadis of the Nordic Ascendant should be able to send another copy of it from the deck or Guldfaxe from the deck to the grave, but it doesn't. Wikia: "You can send a Level 4 "Nordic" monster to the Graveyard for Vanadis' effect." It doesn't work whether I'm playing OCG or TCG. The tdoane server is causing the replay bug. Complain at their site. I playing Lan mode and save replay just fine. both for host and join. The second one, field background only. - is that really needed? The second and when 1.02d will release with kc ladder server? Full Background is just muuuuuuuuuuuch cooler. - Make it a custom feature, like Full Screen is now, you just to need change a line. u can translate this version pls. even if you say like this. but it does not really matter. Update: Wow over 700 votes already. Thanks a lot everyone, this is really encouraging. but if you make a vote on the server, [making special ygopro server and make changes to the new design] need new and very encouraging. and if anyone asks you, important or unimportant you please answer it. I hope you understand. do not be selfish. I can't reply to every single question/comment. Sorry if that looks selfish. It is not on purpose at least. pls add "cards aspect ratio" on fullscreen mode and if is possible i would like to see a scrolling bar on text description, because i want see all descriptions with high font setting. And, if possible, please, add a new skin, the current is very "outdated". Nice work Percy!!! my contribution Here!!! It works but it is glitch-y (the one I have at least - I got the one I have from a different link). at least if you are crowned or serve as the most important person in ygopro, you should be able to draw a conclusion from critics all members. at least you respond and give a hope for better future ygopro. if it was not you who else? If you want help with programmers around the world. There may be here ready to help. make you live vacancies. who knows you could be assisted. good person is someone who can accept criticism and suggestions, and immediately change it to get better. not silent and did not reply. it makes people upset with you. you should be able to change it. Hey percy when 102D will be released? because of you, I change my vote. field should affect the entire duel. Hello, where can I find pictures in the folder "pics" of the Chinese version of the game, thank you. Since all cards are done, I'm going to create a new dueling system and this project will stop updating except bug fixing. Does new dueling system means a new ygo program or an another game like pokemon-pro or magic-pro? And the new cards, he will not add them?